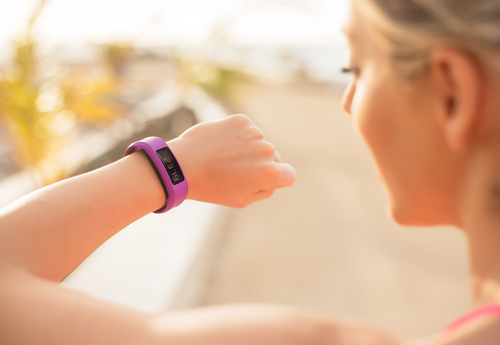 High tech fitness trackers are part of the predicted number one fitness trend for 2016 – wearable technology. It’s now becoming just as cool to wear one of these contraptions on your wrist as it is to wear your watch or bracelet. But there’s some really good potential health benefits beyond the ‘how cool do they look’ effect! If you’re in the right mindset to kick some serious fitness goals in 2016 then there are plenty of gadgets that you can purchase to help you track just about everything from your energy intake to your daily movements and exercise habits. And you’re if you’re interested in grabbing yourself one of these gadgets then you won’t be alone with research indicating that the number of wearable tech devices sold is going to hit about 45 million in the next three years. Why bother using a wearable tracker? Look, even if you’re a regular training guru you could still find some great uses for these gadgets but there are some serious benefits for those of you struggling to move it! You can get your groove into training with a gadget that has a multi-use GPS system that tracks more than one activity. Yep, you can be monitoring yourself running, cycling, swimming or even weight lifting! That’s incredible. On top of that the best trackers come with really cool high functioning apps. Fitbit has been in the game a while and tends to be one of the very popular choices for this reason. For those of you who rely more on sound rather than visual cues you can also grab yourself a tracker with a vibration alert so that you can be given that little ‘trigger’ that you have been sitting on your backside just a little too long! Check to see if it’s waterproof. Some of them are useful for setting goals….This is a great feature if you struggle with exercise commitment. Fitbit Surge is useful here. Check its wireless syncing capacity through Bluetooth to automatically give you data…Jawbone UP3 is a good one here. If you want a tracker that looks more like a piece of jewellery then you can’t go past the Misfit Sine Swarovski for a fitness and sleep tracking device that records your daily activities. If you want an all-round smart watch feature then you may want to investigate the Apple Watch. January 3, 2016 Editor@thefitbusymum Comments Off on Find your right work-life balance (blend) this weekend!